Down 2 Earth Garden Centre offers an assortment of artificial plants for indoor apartment or condo living. You can use artificial plants to decorate your space and add the appeal you're looking for. Our artificial plants come in a wide variety of sizes, shapes and budget. They can be added with different vases or pottery to match your home decor. Artificial plants can be used in apartments or condos to enhance a balcony or terrace. At Down 2 Earth we offer a variety of artificial plants which can be used outdoors. At Down 2 Earth Garden Centre, we stock a number of different home decor such as the artificial plants that can be used indoor or outdoor. 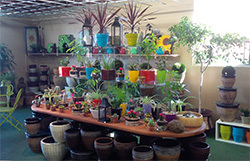 Visit our store for a full display of the different artificial plants and products we carry. At Down 2 Earth we carry a wide assortment of artificial plants which come in a variety of sizes and shapes for all your home decor needs. We have trees, plants, bushes and greens which are available at our store. Come visit to see what's new at Down 2 Earth Garden Centre.